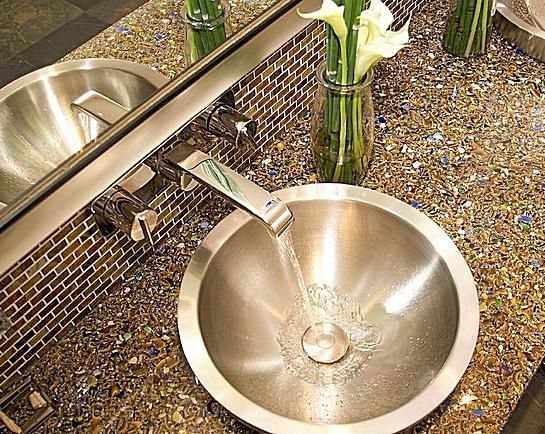 While it's true that the bathroom is one of your home's hardest-working spaces, there's no reason you can't have some fun choosing the countertops. Relax a little! Your bathroom surfaces don't have to be as tough as those in the kitchen, where hot pans, sharp utensils and spilled grape juice are a constant threat. What's more, a bathroom's relatively small footprint makes it possible to go for that high-end granite that might be too expensive to use in a larger space. "I often find that bathroom countertops are much smaller than the typical stone slab, which averages about 130" x 70", says Montclair, NJ interior designer Tracey Stephens, a specialist in eco-friendly kitchen and bath design. "I have gotten many beautiful pieces of granite or marble from my fabricator that have been left over from other projects, and I'm able to pass these cost savings on to my clients." For the average buyer, the selection of materials, colors, textures and finishes this opens up can be both a blessing and a curse. Choice might be cool; but how do you know you're making the right one? Armed with the information you'll find here on the most popular available materials, you'll be able to make the best decision for your home. If your preference for granite is set in stone, you're in good company. Granite and its close cousin, marble, have long enjoyed unrivaled dominance of the countertop market. Other types of natural stone that are fine choices for bathroom surfaces include slate, limestone, travertine and soapstone. It's tough, durable and requires minimal maintenance. It is impervious to moisture and heat. It lasts just about forever. Talk about looks: A profusion of colors and patterns makes each slab a singular work of art. While prices for granite have softened somewhat, stone remains one of the costliest countertop choices. Because a slab is heavy and can crack if it's not properly supported, you'll probably need to hire a professional installer. Even with periodic sealing, porous stones such as marble, travertine and limestone can be damaged by harsh cleaning products like bleach or ammonia. Offering a richly nuanced appearance that rivals the most striking granite, quartz is actually an engineered product consisting of about 95 percent quartz stone mixed with resins and colorings. Familiar brand names include Silestone, Caesarstone, DuPont Zodiaq and Cambria. Quartz is non-porous and never needs sealing. Some manufacturers have added product lines containing recycled materials, a plus if you're eco-conscious. Even though it's a manmade product, quartz can cost as much (or more) than high-end granite and marble. Watch that straight razor or nail scissor: sharp objects can damage a quartz surface. Honed and textured finishes will need daily maintenance to remove fingerprints and other signs of use. Here's a news flash from the National Kitchen & Bath Association that might surprise you: In 2012, granite's popularity in newly remodeled bathrooms actually dropped slightly, while solid-surface countertop installations rose. This could be due to solid surface's lower cost, versatility and stunning range of patterns and colors that pair particularly well with contemporary designs. Solid surface is manufactured from acrylic resin that can include crushed quartz or other stone for a realistic flecked or streaked appearance that rivals granite. Top brands include Corian®, Gibraltar and Staron. Most familiar under the brand name Formica, budget-friendly laminate is manufactured by pressure-bonding a thin plastic surface to a particleboard or plywood base. It was the bath and kitchen surface-of-choice in the 60's and 70's (remember avocado green?). But don't hold that against this easy-care product. Thanks to modern technology, you'll find a huge range of solids, graphic patterns and textures, including surprisingly realistic stone and wood grain looks. Ready-made products are widely available at home supply stores. Laminate can wear thin or dull over time. Chips and dents can't be repaired; you'll probably have to replace the entire counter.